The section beneath the main output consists of several items. It contains gauges for displaying basic character info. There is an avatar which can be customized. It holds a row of buttons which can be activated via mouse click or by using an F button. There is also the command line, where you type commands into the game. Here is a sample image of what this area looks like in the client. All of the Iron Realms games vary slightly in the information displayed here. Some have more gauges and all will customize the button commands for new characters based on their class. Open the settings window by clicking on the gears icon in the lower-right hand corner of the client. Select the F-Key you want to change. Alter it to what you want. Use @tar to substitute for the target you'd normally use. So to make KICK kick your current target, you would put in kick @tar. Label the button whatever you want in the Text field. Ignore the 'Script' field for now. Note that you can also change how many F-Keys you have here. [Achaea only]: If you put a command from Battlerage on an f-key, it will highlight automatically when you have enough Rage and it's not in cooldown. Note: You can get more information on the settings page. Toggle the 'reduced gauge height' option. Here is an example of the default gauges and buttons. Here is an example of the shorter gauges and buttons. Right click with your mouse on the client main window. This will generate a menu with several options. Toggle on or off the options you wish. 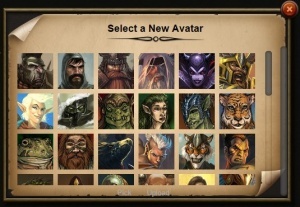 Right-click on the avatar and then you can either select one from the pre-loaded options. You may also click the 'Upload' link at the bottom of the window and upload your own. This page was last modified on 16 February 2016, at 22:53.